Having insects in your home can be frustrating and we definitely understand wanting to get rid of them. Unfortunately, using chemical products to kill insects in your home can turn a frustrating problem into a dangerous one. The products might get rid of the insects (for a little while), but they can also pollute your household air and they’re particularly dangerous to pets and kids. Don’t worry, you’re not at a loss. There are safer solutions that can leave your home insect free and smelling fresh! Your best friends in these situations are plants that have a high volatile oil content (plants that smell good). Plants create their smells to attract those insects that pollinate them and to repel those that can harm them by eating their foliage or taking water and nutrients from the root. Often times, just growing plants that have a strong smell will keep the insects away. 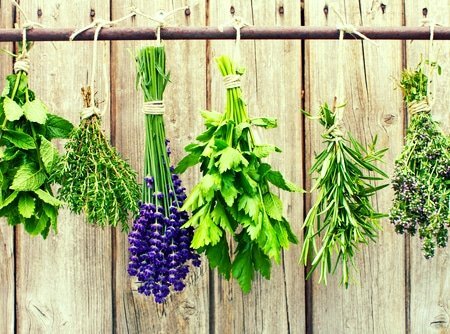 Sage, thyme, lavender, and rosemary are all amazing for repelling bugs, and if you’re growing them, you can make your natural house repellents for almost nothing. Another great helper is food grade diatomaceous earth, which is lethal for insects because it has tiny, sharp edges. You’re going to see that come up over and over in these recipes. When you’re using it, be careful not to breath it in. It’s fine once it settles, but it can get into your (and your pet’s) lungs and make tiny cuts. Get a glass spray bottle like this one. Fill it ½ with vinegar and ½ with water. Add 10 drops of essential oils of mint, lavender, and eucalyptus. Spray to keep the insects at bay. The bane of any homeowner’s existence, it seems like once ants decide that they want to be in your house, it’s almost impossible to get them to leave. Ants are attracted to sweet things, so make sure that you tighten the lids on your honey jars and clean up any spilled milk (and jam, and definitely all the cookie dough). Check the baseboards, the windows, and the doors all the way around your house for cracks. Anywhere you think an ant would fit, sprinkle a little bit of diatomaceous earth. Add a little bit of cayenne powder to your diatomaceous earth for a spicy scent that ants don’t like. Ants leave a trail for each other to help find food and bring it back to their nest. Spray the base of your house, your doors, windows, and floor with your homemade house spray to disrupt their trail. Cockroaches are bigger and grosser than ants and an infestation is dangerous to your health. If you see a cockroach in your house, jump to action—there are probably more. The larger the infestation, the more dangerous. Cockroaches like to live where they can get easy access to food and water, so sanitary living is key to keeping them out, especially in the kitchen and bathroom. Fill in cracks and holes in the baseboards around your house as well as in high places (like above cabinets and windows) with diatomaceous earth. Like ants, cockroaches leave trails to help each other find food. Use your homemade spray around the base of the house, and in kitchen cabinets, closets, the pantry, and the bathroom. Place bay leaves in your kitchen cabinets, closets, pantry—anywhere you store food. It will throw off the scent of the food the little critters are looking for. Roaches like stale beer because it smells similar to their food-finding pheromones. Place an old bottle of beer about a quarter full with a tablespoon of vegetable oil in the infested area. The cockroaches will go in and not be able to get out of the bottle. When the bottle is almost full, take it far, far away. Replace it if you think there are more. Fleas are often the most difficult to get rid of because they make their way into your house in so many ways. They can be on your clothing or your pets, or can come from your neighbor’s house or even from neighborhood animals passing by. Growing plants that have a strong smell, like mint, lavender, and rosemary, really help to keep opportunistic fleas out of the house. Flea comb daily. Get a little bowl with some soap and drop any fleas that you find on their coat into the water. Make a powder flea repellent that will also kill the fleas. You can make a lot at once and use it for a long time. Just sprinkle it lightly all over your pet and brush/rub it into their coat before you go out for a walk. It's simple, just powdered herbs like mint, lavender, sage, fleabane, and rosemary. Caution: A lot of recipes call for the diatomaceous earth here, but if your pet breathes it in, it could make little lacerations in their lungs. Spray everything in your house with your spray! Good places to get: your mattress, box spring (they’ll hide out between the mattress and the box spring), pet beds, doors, windows, furniture, rugs, closets, and anything with fabric. You can also spray your canine friends. Vacuum daily and always throw the bag away or clean the filter right away. The vibrations of the vacuum can actually hatch the eggs so you want to get that out of your house as soon as possible. Directions: Strain the tea after about 15 minutes steeping and pour slowly over your furry friend, working it into their coat after their bath. Have you tried any of these methods or have your own? Let us know in the comments below! Greenhouse Pest Management – Are Cockroaches a Health Risk? Hi, its nice post about media print, we all know media is a great source of facts. to wipe out the places where the bed bug infestation has taken root, in the home. time to drive pests away from their homes. The illnesses that they carry are salmonella infection, causing GI problems like dystentery as well as gastroenteritis. I’ve had good luck with plain cinnamon keeping ants away. Just sprinkle a little on each end of the windowsill.